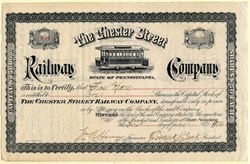 Beautiful certificate from the Chester Street Railway Company issued in 1904. This historic document was printed by the John Spencer Printer & Bookbinder Company and has an ornate border around it with a vignette of a trolley. This item has the signatures of the Company’s President, J. Frank Black and Treasurer, and is over 106 years old. History of Delaware County, Pennsylvania. The Chester Street Railway Company. - In 1870 the recognized need of a public means of passenger transportation from one section of the city to the other was attempted to be filled by the establishment of an omnibus line, the route extending from the Pennsylvania Military Academy, in North Ward, to Third Street and Highland Avenue, in the borough of South Chester. The project failed after a few months' trial, and those who purchased stock in the enterprise derived considerable experience from the investment, even if the assets of the company were insufficient to discharge its outstanding obligations. In the spring of 1882 the question of street-railways began to be discussed among a number of the capitalists of Chester and South Chester, the only public means of communication between the remote limits of these places, several miles apart, being a line of rickety, uncomfortable stages. Upland, a mile and a half beyond the city line to the northwest, was then considered impracticable of access by reason of the steep hills on the road. Several attempts to establish a street railway in Chester had, prior to this time, been made by capitalists in Philadelphia and elsewhere, but all of them had failed before work of laying the road had commenced. The capital required to build and equip the road was subscribed almost exclusively by citizens of Chester and South Chester, and the stock was distributed among a large number of holders. On June 27, 1882, the first meeting of the subscribers was held at the office of George B. Lindsay, Esq., in Chester, when the name "The Chester Street Railway Company" was adopted, and officers elected. Richard Peters, Jr., was chosen president; Hugh Shaw, vice-president; William Appleby, treasurer; George B. Lindsay, secretary and solicitor. The board of directors was as follows: Richard Peters, Jr., Hugh Shaw, William Appleby, George B. Lindsay, J. Frank Black, Samuel H. Dyer, F. Washington Thomas, William S. Blakeley, Thomas J. Houston, J. Newlin Trainer, and Robert Wetherill. The capital stock of the company was fixed at fifty thousand dollars, to be divided into one thousand shares of the par value of fifty dollars each, which sum was required to be paid in full on every share taken. A charter was obtained from the commonwealth and ordinances adopted by the city of Chester and borough of South Chester, that of the city being approved by the mayor July 26, 1882. On Oct. 17, 1882, the building of the road was begun, and completed the middle of January following. The route of the road extends from Clayton Street, the southern limits of South Chester, along Third Street to Market Square, in the city of Chester; thence up Market Street to Edgmont Avenue to Thirteenth Street, where the stables, car-house, and office are located, the length of the road being about three miles. On Feb. 1, 1883, the company began regularly to operate the road, with forty horses and five cars. The schedule of time was every half-hour from an early hour in the morning to a late hour at night, and the fare established at five cents. The amount of travel from the first day exceeded all expectations, and a few weeks later additional cars and horses were put on the road, and the time of the starting of the cars changed to every fifteen minutes. E. Mitchell Cornell, formerly secretary and treasurer of the Second and Third Streets Railway of Philadelphia, was appointed superintendent, and elected secretary of the company. In compliance with a general desire, the company determined to extend the road to Upland, on condition that the borough authorities should reduce the grades on the hills. This was done, and on July 14, 1883, the road was completed to that borough, thus increasing the length of the road to four miles. Cars began running on that date from Upland to Market Square every half hour. The working stock has been increased to sixty-seven horses and mules and twelve cars. Each car, which is in charge of the driver, is drawn by two horses. No conductors are employed, the fares being deposited by the passengers in Slawson patent boxes. The traffic on the road averages two thousand passengers per day. The enterprise is in a prosperous condition, has no debt, and has paid from the beginning a small semi-annual dividend.